With Christmas rapidly approaching, studios are frantically trying to wedge their films onto screens in order to pick up holiday business. This week's offerings include a family fantasy based on a popular series of books, an action-adventure film and an Oscar-baiting drama starring Adam Sandler. A late entry in the "Longest Title of the Year" contest, Lemony Snicket's A Series of Unfortunate Events is based on the first three books in the best-selling children's book series. Inhabiting that same area of "cheerful grimness" of Roald Dahl and Shel Silverstein and the spirit of Charles Dickens, it's the story of the Baudelaire children, orphaned by a house fire and delivered into the hands of their money-grubbing uncle Count Olaf. Since they inherited a vast fortune, Olaf's intentions may not exactly line up with the children's best interests. It's no surprise to see that Hollywood would attempt to produce a film from these books, after the stunning success of the Harry Potter films opened their eyes to the revival of "kids' lit". Not wanting to take a chance, they stuck Jim Carrey in the villain role, giving it some star power. 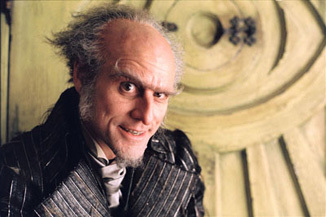 The role of Count Olaf is one that basically gives Carrey free reign, which probably sounds to you like either the greatest idea in the world or the worst, depending on what you thought of The Grinch. Directed by Brad Silberling, and with set design that makes Tim Burton think, "Oh no you din't", Lemony Snicket is aiming to be the big Christmas family movie. Its kid credibility is unimpeachable, with 25 million books sold. However, adult crossover is not going to be as strong, though that's ostensibly what Carrey, Meryl Streep and Jude Law are for. In the grand view, Harry Potter's records are pretty safe. Critical sentiment is running hot and cold, with some feeling that the enchanting darkness of the books has been sanitized somewhat, but most agreeing that imagination practically drips from each frame. Opening on 3,620 screens, Paramount is looking for blockbuster numbers to salvage a generally disappointing year (and to launch a potential new franchise). They should get this Christmas wish with numbers similar to what The Grinch pulled in four years ago, or around $52 million. If there's one thing James L. Brooks knows well, it's how to make movies the Academy likes. Of the four films previous to this week's Spanglish that he directed, only the flop I'll Do Anything failed to be nominated for the big prize, and that was after it was focus grouped to death. Whether it would have fared better as originally planned, a musical about Hollywood featuring Nick Nolte and Albert Brooks singing(!) is perhaps best left to speculation, but I digress. Spanglish hopes to join those ranks by being this year's As Good As it Gets. Adam Sandler continues to try and expand his dramatic reach, starring as the patriarch of a slightly dysfunctional, newly rich family, with Tea Leoni as his uber-high maintenance wife. Enter Paz Vega as the newly arrived immigrant from Mexico as their maid, with perhaps some lessons for all to learn, even though she speaks no English. If it all seems potentially a bit patronizing to you, you're not alone, as the premise really does seem like something only someone from Hollywood would come up with. Romantic temptation from a drop dead gorgeous maid? An unredeemable harpy for a wife? Sitcom level jokes? No one, not even the maid, performing visible, productive work? It's all here in spades. Adam Sandler as competent dramatic actor hasn't been an issue since his revelatory performance in Punch-Drunk Love, and this is essentially a romantic comedy, so he isn't likely to be an issue here, though his Happy Gilmore fans aren't likely to follow. Some critics have been hacking away at the film's (over? )abundance of sentiment, while others have been praising it for that very same reason. As essentially the only romantic comedy in the marketplace right now, Spanglish has some territory all to itself, though that has never really been a guarantee of much of anything. Moreover, it looks just bland enough to be a hit, though too bland to really break out. Look for about $17 million this weekend, and just possibly a run at some Oscars. It's been that kind of year. Jumping up to this weekend to fill the "airplanes on screen" hole left by The Aviator's duck out to Christmas Day is Flight of the Phoenix, a remake of the 1965 Jimmy Stewart film. Starring Dennis Quaid, Giovanni Ribisi and Tyrese (somehow allowed to act again after 2 Fast 2 Furious), the film features a band of cast-offs who crash in the Mongolian desert and need to build a new plane to get out before nomads overrun them (I hate when that happens). Generic action ensues. Directed by John Moore, who brought us the waste of Owen Wilson and Gene Hackman that was Behind Enemy Lines, this will be a test of just how effective the breaking of the curse of Dennis Quaid has been. My guess? Not very, as even though The Day After Tomorrow was a huge hit, it had scant little to do with him, and both The Alamo and Cold Creek Manor were high-profile flubs. An action film is usually a pretty safe bet at this time of year, though, and even one as unremarkable as this one should score a few bucks. Expect a mediocre $11 million, as there's nothing about this that looks particularly bad, but that's mostly because we haven't seem much of anything in the way of footage. Ocean's Twelve did an impressive job of nearly matching its original's opening weekend, bringing in just over $1 million more. Considering the effect of inflation and the increased interest that sequels generally have, this is actually a step backwards. While word-of-mouth is generally respectful to the film, there seems to be a "been there, stole that" feel and it's hard to see this matching the performance of Ocean's gang numbering eleven. It will fall to at least second place, easily, coming in around $22 million. It fared better in the sequel capacity than Blade: Trinity, where even fans of the first two films were throwing bombs the movie's way. Coming in at an anemic $16 million, a number under even the 1998 original's opening weekend, Trinity has the potential to bring this series to an end. Not that there was a tremendous amount of material to cover here, but you take franchises where you can get them. A steep drop to $6 million is likely. Five Golden Globe nominations for each of Closer and Finding Neverland, including Best Drama in both cases, should result in a slight bump for each film this weekend, or at least a softening of their declines. This is the first of four such significant occasions this awards season, though it is by far the smallest. Seven more nominations for Sideways, plus awards from NY, LA, Toronto, and San Francisco critics could make it the big winner, on a ratio basis, of awards season. Even with the extra attention, only Closer is likely to remain in the box office top ten, as all three are still on relatively limited screens. Most of the rest of the Oscar contenders come out to play this weekend as well, though in limited release. The Aviator, Martin Scorsese's biopic about Howard Hughes, debuts on 40 screens, Clint Eastwood's Million Dollar Baby launches on eight, and Kevin Spacey's portrayal of Bobby Darin in Beyond the Sea debuts on six. While the first two are almost assured to be in the mix, the latter film has had a bumpy road and will need an extremely good box office performance to stay in the mix.